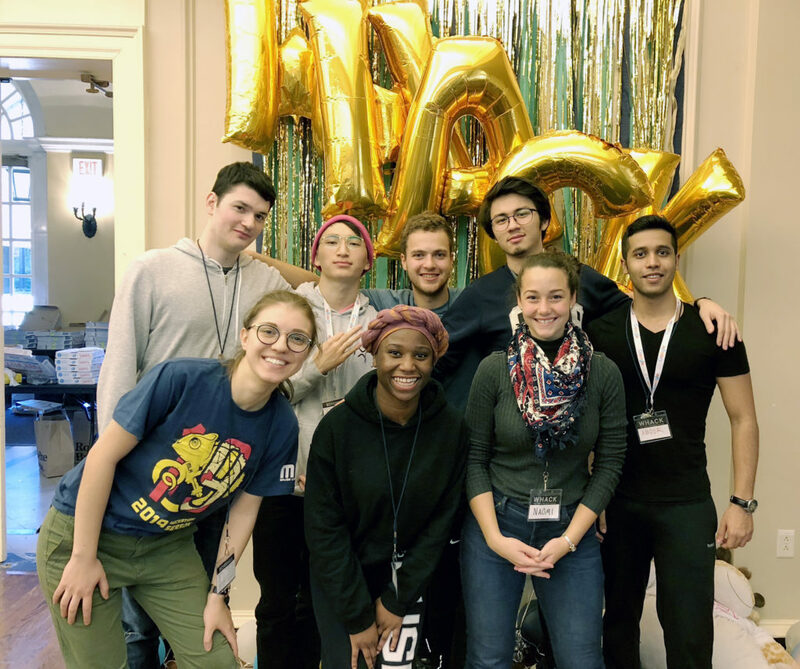 Competing in WHACK, a 36-hour hackathon at Wellesley College, were, front, from left, Daria Manea, Faustina Owusu, and Naomi Geffken; back, from left, Evan Hoffman, Alan Ruan, Sam Rubel, Akhmadjon Kurbanov, and Abdur Rahman Muhammad. Eight Clark University students won spots to compete in WHACK, a 36-hour hackathon held Nov. 2-4 at Wellesley College, with several netting top prizes. The competition drew 300 college students from throughout the Northeast. Six of the students were participating in their first hackathon, but the competition was nothing new for Abdur Rahman Muhammad ’20 and Evan Hoffman ’21. In September, Muhammad won a top prize at HackMIT. A few weeks later, Hoffman netted a Microsoft-sponsored prize at HackHarvard. At Wellesley, the eight students spanned three teams to produce apps focused on some of the world’s toughest issues, from climate change to mental health. The event included workshops, speakers from the technology industry, and recruiters from various companies. The first team included sophomores Hoffman, Akhmadjon Kurbanov, and Sam Rubel. The three computer science majors collaborated to produce EcoPath, which provides commuters with the most carbon-neutral paths to their destinations. In addition to its environmental focus, the app incentivizes people to “go green” by promoting their good deeds via social media, Hoffman says. The judges recognized EcoPath team members for their exemplary creation of location-based software, awarding them a prize for Best Use of Here.com’s application programming interface. The second team included Muhammad, a computer science major, and Naomi Geffken ’21, a double major in political science and economics, along with two first-year students from Boston University and Northeastern University. They created an Android app called E-Mission, which provides a cost analysis of electric cars. The app appeals to users’ environmental consciousness and to their penny-pinching habits by calculating how much they might save in dollars and carbon emissions if they use electric transport. The E-Mission team won prizes for MassCEC Best Clean Transportation Hack and for Best Use of Google Cloud Platform. “Hackathons are a great experience to interact with different companies,” says Muhammad, who won a top prize at HackMIT in September. At Wellesley, he interviewed with a top financial firm and connected with two technology companies. Geffken networked with several companies and says she also benefited from connecting with other students. The third team comprised three sophomores, all computer science majors at Clark — Daria Manea, Alan Ruan, and Faustina Owusu — and a student from Wellesley College. They created Mood, an app that allows users with mental health issues to share their experiences anonymously with each other. The students noted how Li Han, professor and chair of the Mathematics and Computer Science Department, has been instrumental in supporting them. For Owusu, the hackathon provided the experience and skills she’ll need after graduation.